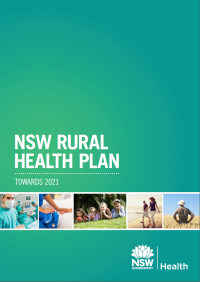 The NSW Rural Health Plan: Towards 2021 aims to strengthen the capacity of rural health services to provide world class connected and seamless care for people living in regional, rural and remote NSW. Building on significant achievements made to date in rural health services, the plan sets directions and strategies to​ improve rural health services and aligns to the NSW State Health Plan: Towards 2021. Key rural health issues in the plan were identified via extensive consultation with rural clinicians, service providers and communities, as well as state and local government representatives. The development and implementation of the plan is also supported by the Ministerial Advisory Committee for Rural Health, which is appointed by the Minister for Health. In December 2018, the NSW Rural Health Plan: Progress Report 2017-18 was released. The report summarises progress across NSW Health in implementing the NSW Rural Health Plan.